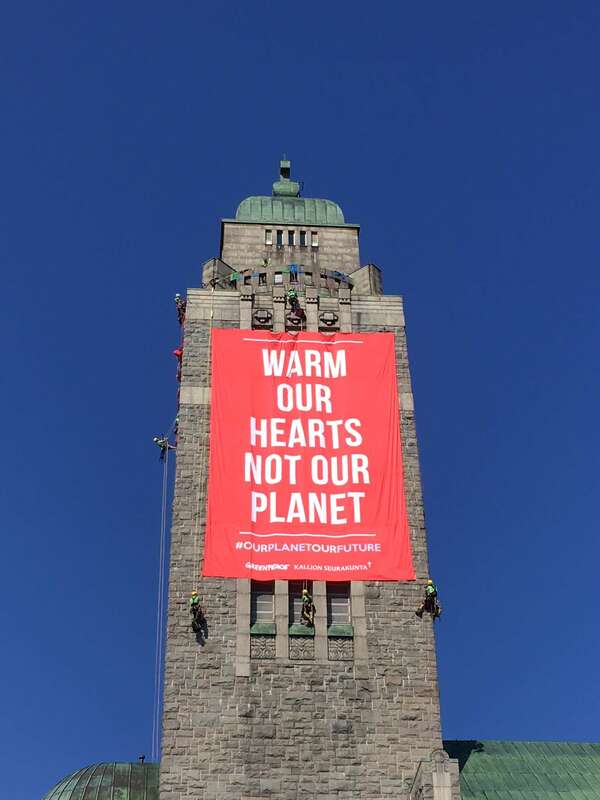 Helsinki, Finland – While Presidents Trump and Putin are meeting in Helsinki, Finland, Greenpeace Nordic activists have unfolded two large banners in the high bell tower of Kallio church in Helsinki. The banners are calling the Presidents to “Warm Our Hearts, Not Our Planet”. Greenpeace and the parish want to remind all those whose eyes are on Helsinki on this day that empathy and action are the keys to protecting the planet from climate change and environmental destruction. “Climate change is the defining challenge of our generation and its impacts are felt by us today, putting our lives in danger. Everywhere in the world, people are determined to break free from fossil fuels. It is disappointing that presidents Trump and Putin are not helping us” said Sini Harkki, Greenpeace Nordic Programme Manager for Finland. “But people power is the real superpower. Today, we are spelling this out: the change is already happening, with ordinary people leading and demanding a transition to clean, renewable energy worldwide and holding politicians and polluters to account”, said Harkki. While Trump wants US to leave the Paris climate agreement, many US states, cities and businesses are still committed to the agreement to stop climate change. The majority of US citizens support staying in the Paris Agreement. The activity was carried out in cooperation with the parish of Kallio of the Evangelical Lutheran Church of Finland. On Monday morning the activists hung the banners on two sides of Kallio church tower, well visible in the city of Helsinki. 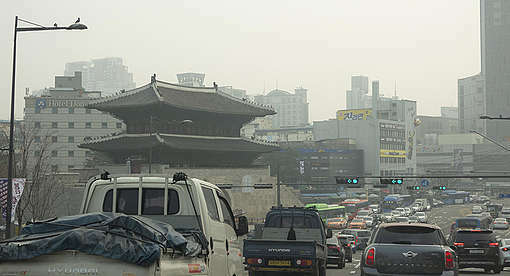 “Greenpeace is committed to a peaceful world where the environment is protected. 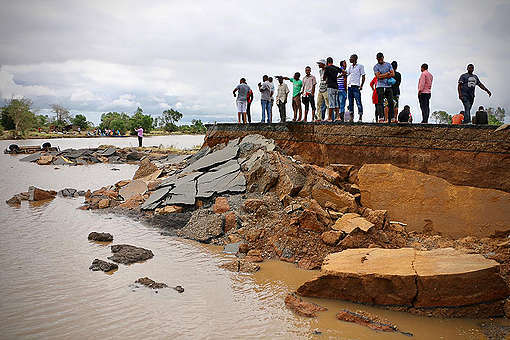 Real leaders put Planet Earth first and tackle urgent global threats such as climate change, destruction of forests and the unprecedented pressure on our oceans” said Harkki. Siberia's bounty perhaps is of the essence behind Trump's actions. Indeed Russia has ages old land grab policies as their bread and butter act. Behaving of this small tribe can only give problems to the world unless the size of Russia's territory is addressed.